The 40-year old house is alive again after big renovation but still keeping its unique style. We intend to make Weeping Willow like your home in Bangkok. 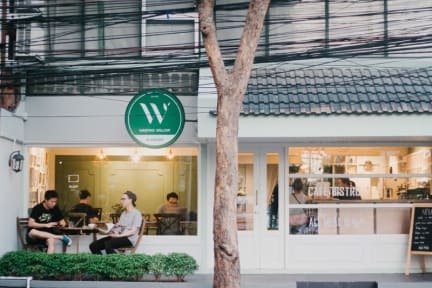 Weeping Willow is located in the most greenery street in Sukhumvit area. You will find the real relax and cozy place in Bangkok CBD. Weeping Willow has become our “home away from home” any time we’re in Bangkok. The staff are incredibly friendly and helpful, the beds & pillows are a good respite from typical Thai beds, and the breakfast is always tasty and fresh (one time there was even Thai donuts)! 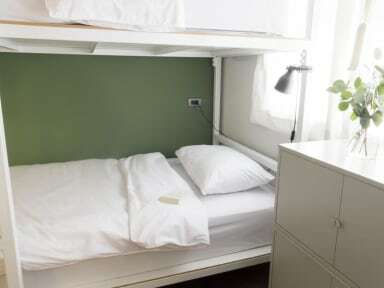 We’ve stayed in the 4 bed and 8 bed dorm, both of which offer ample privacy (the 8 bed has privacy curtains). The AC and WiFi are strong, and the location is tucked far enough off Sukhumvit so there is less noise. My stay at Weeping Willow was great. Despite arriving many hours before the official check in time, they realised I was tired and jet lagged and found me somewhere to sleep temporarily. This was hugely compassionate and beneficial. I also had an early flight booked on the day I checked out and they made me breakfast 3 hours earlier that the scheduled time. The people there are lovely, kind and generous. We really liked this family-friedly cozy hostel that looked like an old English cottage. Cafe is open 24h/d and the room we had was lovely. Also, there is a nice bakery with amazing cakes round the corner. Although this was on the higher end of our backpacking budget, this hostel is totally worth it - we have stayed there every time we've been to Bangkok. The atmosphere is so clean, cute, and welcoming. The beds are super comfortable as well. However the thing we loved the most was the attentiveness of the staff. We were leaving at 4:30 am for a flight, and the staff helped us call a taxi, load us in with our luggage, and help interpret between the driver and us. We will miss this gem! Gorgeous little hostel in a quiet, calmer area of BKK, but still close enough to wander towards the action. Delicious food in the restaurant / bar, cosy, cute rooms. Bathrooms very clean, but beware the temperature of the showers. This would be my only criticism - you either had a choice of scalding hot or freezing cold, with nothing comfortable in between that lasts enough to wash in. If this problem with temperature regulation is fixed, I wouldn't hesitate to stay here again. THEFT WARNING: only has a small locker box inside your bed bunk. Not able to be locked. I went out one afternoon and only took a little money with me. I hid the rest in my toilet bag in the locker. The next morning I went to get more money for the day, guess what? It was all gone. There were only 2 people in the room with me and one of them seemed to be working there so...learned my lesson! Management didn't believe me, was blaming me etc. Just know this. I left that day to another hostel. Nice modern looking hostel. In a decent area, very close to Train Station and shops. Bathroom don't fully close so area smelt gross (odd brushing teeth in that area), and shower water is scorchingly hot (very difficult to shower)! AC is very strong in rooms.